Blanca Millan takes the ball up the court in this UMaine file photo. Millan scored 18 points in the women's basketball team's season-opening victory over Toledo Saturday. University of Maine senior guard Tanesha Sutton (23) goes in for a layup after getting inside position on Toledo's Sara Rokkanen during Saturday's college basketball game at the Cross Insurance Center in Bangor. Toledo's Jaela Johnson (25) and Kaayla McIntyre look on. UMaine triumphed 73-59. University of Maine junior guard Blanca Millan (22) shoots a short jump shot during Saturday's season-opener against Toledo at the Cross Insurance Center in Bangor. Toledo's Kaayla McIntyre (15), who finished with a game-high 24 points and seven rebounds, boxes out UMaine's Kira Barra (32). UMaine won 73-59. University of Maine junior guard Blanca Millan (22) drives in for a layup with Toledo's Sara Rokkanen (1) looking for a possible rebound. UMaine's Dor Saar (15) checks out the action in the background. 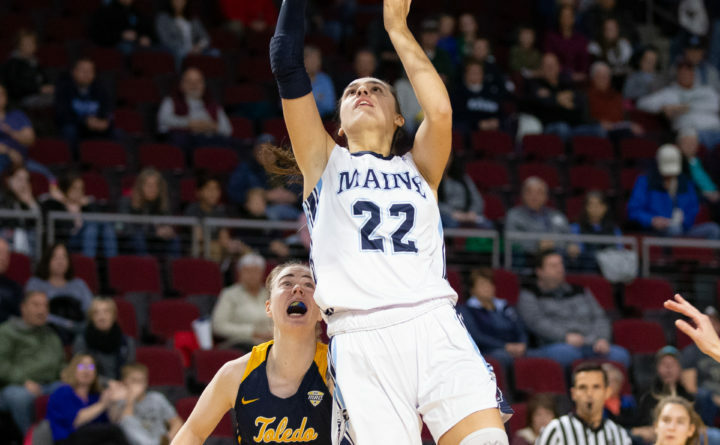 Millan finished with a team-high 18 points to go with six rebounds and six assists to lead UMaine to a season-opening 73-59 win at the Cross Insurance Center in Bangor on Saturday. Guard Parise Rossignol had been sidelined with a tender ankle until the middle of this past week but she showed no ill effects on Saturday afternoon. 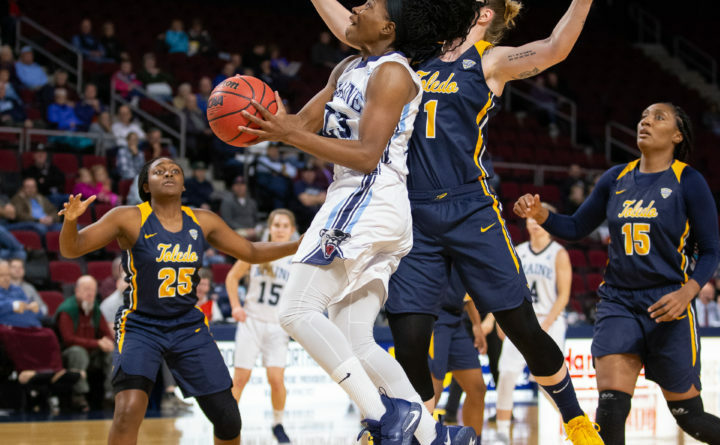 The senior from Van Buren nailed four 3-pointers in the first quarter, including three in succession, to stake the University of Maine to a lead it would never relinquish en route to a season-opening 73-59 women’s basketball victory over Toledo at the Cross Insurance Center. Rossignol finished with 15 points, which tied her career high, and she was one of four Black Bears in double figures. She also grabbed five rebounds. 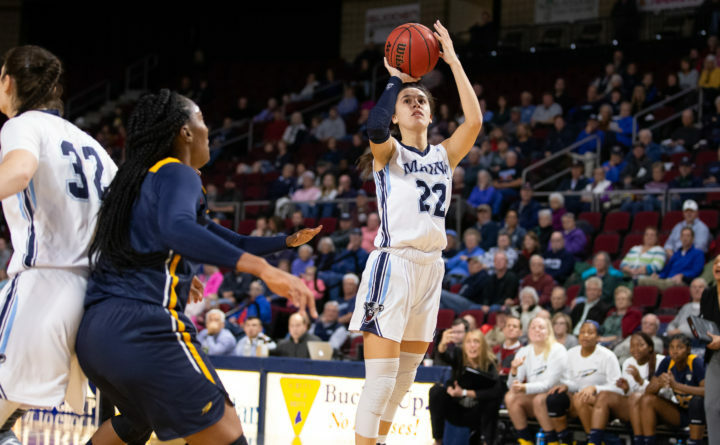 Junior guard Blanca Millan, an All-America East first-team selection last season, led the way for UMaine with 18 points — including nine in a row during a critical stretch in the third quarter to expand the lead to 59-38 after Toledo had used a 10-2 run to close the gap. Millan provided six assists, six rebounds and two steals and held third-team All-Mid American Conference guard Mikaela Boyd to six points and just two field goals in eight attempts. Boyd had 18 points in Toledo’s 65-64 overtime victory over UMaine last season. Sophomore point guard Dor Saar (five assists) posted a career-high 15 points despite sitting out most of the third quarter with foul trouble. Junior forward Fanny Wadling contributed 11 points and seven rebounds along with three blocked shots and Tanesha Sutton wound up with six points, a game-high nine rebounds and two assists. Senior center Kaayla McIntyre scored a game-high 24 points for Toledo and also had seven rebounds. Tanaya Beacham came off the bench to contribute nine points and four rebounds and Sarah St-Fort had six points and eight rebounds. Rossignol hit her first three-pointers of the game as she sandwiched threes from each corner around one from the top of the key to turn a 4-2 deficit into an 11-4 lead. The defending America East champs led by at least three the rest of the way. UMaine had a 43-28 lead at the half and led by as much as 27 in the fourth quarter before Toledo scored the game’s final 13 points. With the departure of 3-point specialist Julie Brosseau, who transferred to the University of Utah, Rossignol will be one of the players expected to help fill that void. “That’s a big part of my role,” said Rossignol, the state’s second all-time leading scorer with 2,589 points at Van Buren High. “Hitting that first one takes the pressure off you. It makes things a lot easier. Everyone found me and if I’m open, I’m going to put it up. “I was happy with the win today,” Rossignol added. UMaine went 13-for-36 from beyond the 3-point arc compared to Toledo’s 3-for-13. “We were outscored from the 3-point line 39-9. That’s the game right there,” said Toledo coach Tricia Cullop. “I was disappointed in some of the things we did but that doesn’t overshadow the fact Maine has a great team. The Rockets’ third-period 10-2 run made it 50-38 with 3:02 remaining. But that’s when Millan regained the momentum by scoring the next nine points in just 1:08. “Blanca took over there. That was that,” said UMaine coach Amy Vachon. Millan hit a driving layup off a Rossignol pass, nailed a long 3-pointer from the top of the key, sank a pair of free throws and then capped it with a steal and a layup. Millan pointed out that they received valuable contributions from the bench as well. “They did a really good job. They didn’t commit any turnovers. That’s huge for us,” said Millan. 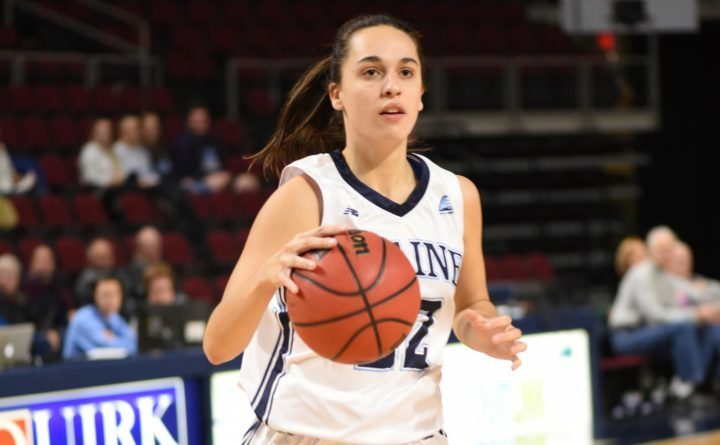 UMaine will visit Bryant University (R.I.) on Tuesday at 7 p.m. before hosting former UMaine head coach Joanne Palombo McCallie’s Duke Blue Devils on Thursday, also at 7.